We’ve all done it one time or another – scrimping and saving to finally bring our dream purchase into fruition. Sometimes are certainly easier than others – namely when the price tag is barely a splurge. Other times, we hit the ground running, only to fall prey to the temptation of lattes, pricey meals and toys. So, what exactly can one do to steadily save money to purchase a future splurge? Make the journey fun, of course! Below, we’ll discuss two fun ways to help you effectively save for a future splurge. If you were a rebellious child, you likely contributed heavily to your mom’s swear jar. Each time you said a swear word, you had to drop a quarter into the swear jar. It sure did stink when you were five. But, chances are your parents used that money to buy you a new toy. Well, the same logic applies to your dream jar. But, the stakes are much higher than a mere quarter—you’ll have to drop $10 into your dream jar. Each time you find yourself lusting after your dream purchase (and yes – performing a Google search counts), drop $10 into your dream jar. By the end of week one, you’ll likely have a minimum of $100 in the jar. In addition to each $10 “penalty,” drop $20 into the jar each pay day to provide a boost. Tip #1: Money is tight in most households&mdsh;it’s understandable if your budget doesn’t allow dropping $10 into a jar several times per day. Feel free to drop in $1 or $5 bills into your dream jar as your penalty. It’ll certainly take longer to reach your goal, but you’ll be able to maintain your pace without feeling the pinch. 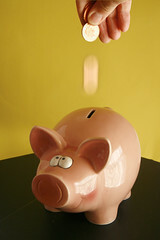 Tip #2: Consider using www.smartypig.com as your virtual dream jar. You can manually transfer money from your bank account to your smartypig account at your convenience. And in addition, the website gives you an extra 12% of your total savings if you choose to cash-out in the form of a gift card rather than direct deposit or a check. Therefore, if you save $2,000 all on your own, you’ll receive an extra $240 from Smartypig. As you can see, saving money towards a pricey purchase needn’t be difficult and daunting. You can easily maximize your efforts by flirting with your financial endurance with a fun savings game, such as the one mentioned above. This is a guest post from the AccessRX writing team. They have hundreds of articles published online and in print, covering everything from beauty tips to purchasing prescriptions online to sexual health to parenting, fashion, entertainment and more. Using Smarty Pig is a good idea for something like this. lot of it is popping it up all over the internet without my permission. Do you know any solutions to help prevent content from being ripped off? exercising caution when you choose to date online. Online dating and chatting represent the virtual small talk of two people on a regular date, who need to find out more.